The Seacourt Team set out on Sunday 30 October 2011 from various parts of Hampshire to convene at Bucks New University in High Wycombe to compete in the Wellesbourne Trophy Team Competition. For the uninitiated, the Wellesbourne is an invitational club competition run by Wellesbourne Sword Club. Clubs enter teams of two in all six fencing disciplines. The competition Trophy goes to the Club that wins the most bouts overall. 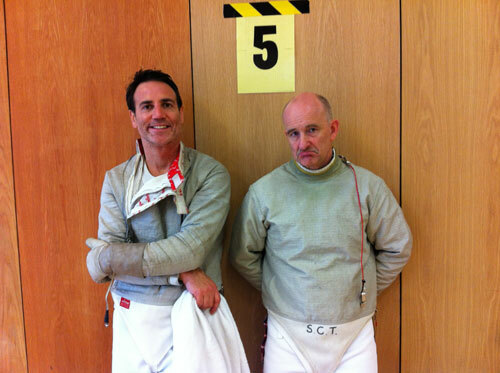 The Men’s Épée team this year consisted of Gary Callaway and Alex Chapman. 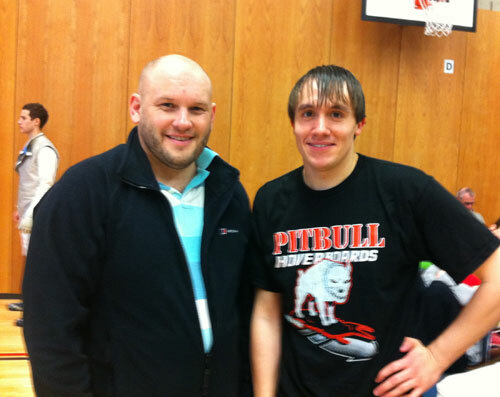 Alex won 3 of his bouts and can be quoted as saying that the competition was ‘good and he enjoyed it’. He added that he ‘hates épée’ (but I’m sure that he didn’t mean it). Gary, who still managed to be late, despite having the extra hour of the clocks going back, didn’t know how many he won or lost proclaiming it as unimportant. He did however manage to muster the energy to say that the day had been ‘fantastic’! Unfortunately there was no Seacourt Ladies’ Épée team this year. So get practising ladies for next year! No excuses. 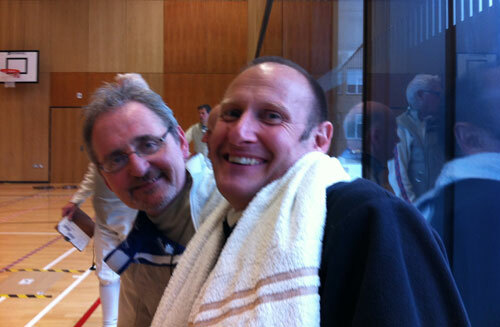 Carl Morris and Chris Jupp were the stalwart pair who made up the Men’s Sabre team. Carl was fencing left-handed which confused some of his opponents and provoked plenty of comment. Carl’s summary was that he lost 3 and won some and thought that was a ‘sinister result’. I’m sure this witty reference to his left-handedness has left you rolling in the aisles. Chris fared the same as Carl and came out with the sage advice: ‘don’t drink the night before’. Good advice Chris, I’ll be sure to ignore it. 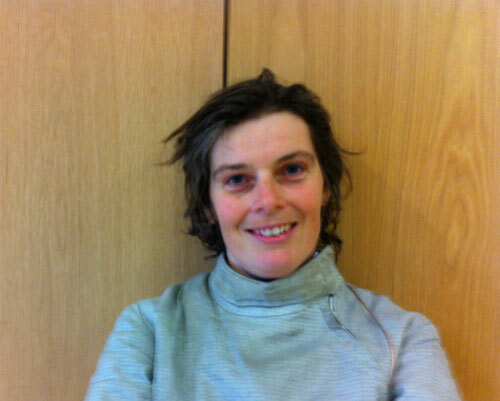 Luce Wright was the forlorn sole representative of Ladies’ Sabre for Seacourt this year. Anyone else want to try their hand next year? Hint hint. Due to a pretty woeful turnout in this section, the lady sabreurs (sabreuses?) first fought in teams which contributed to the team score and then all fought each other to come up with an overall winner. The results were completely topsy turvy, with some fights which were 5-1 in the first round being 1-5 in the next round. But that’s the vagueries of ladies’ sabre for you. Unfortunately, Luce put in a fairly average performance in the final barrage which she lost to Jo Heywood, finishing up second overall. After sulking for a fair while, Luce said that she’d had a brilliant day and that she wouldn’t have missed it for quids. 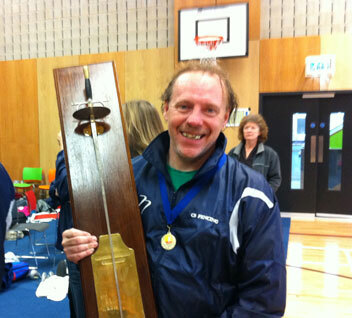 The Men’s Foil team was made up of the old silver fox, Martin Toms and Seacourt’s recently reclaimed Andy Southwell. Despite having been absent from fencing for quite a long time due to paternal requirements, Andy did fabulously, keeping a clean sheet throughout the competition. He said that ‘it was definitely the clean sheets that did it’. Nice one Belinda! Martin ‘lost quite a few’ but still reckoned that he had a good time. At least he didn’t have to buy the drinks which must have considerably enhanced his enjoyment! 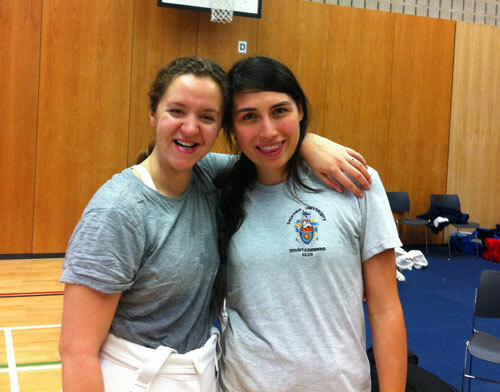 Miriam Alcaraz Stapleton and Kate Hoctor were the worthy representatives of Seacourt for Ladies’ Foil. After the fighting was over and she had had time to catch her breath, Miriam said she had only won one, but that it was a really good one! We believe you Miriam! Kate won four and lost four and said that you always win the ones you should lose and lose the ones you should win. Hmmm. Cryptic! I’ll be sure to remember it for the future. 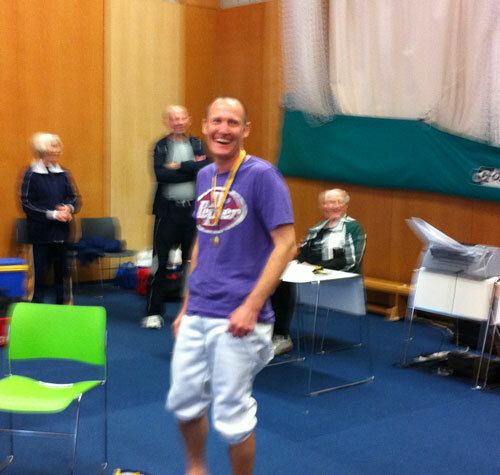 Andy bags the best foilist medal! Thanks to Andy’s stirling performance in the Men’s Foil, not losing a single bout in the competition, he copped the medal for the best Men’s Foilist. Everyone at Seacourt was really proud that one of the team had done so well. And Andy looked pretty pleased, although somewhat flushed (which clashed terribly with his purple T shirt), when he received his medal. Loving the barefoot look Andy! At this point it would be churlish not to congratulate the winners of the Wellesbourne Trophy 2011. So a hearty cheer goes to the Civil Service. We’ll see if we can stop you next year!